in october 2017 choreolab europe organizes a 4-day spring lab in basel, where advanced and professional dancers, movers, dancing choreographers and dance students can participate. in this lab choreolab europe collaborates with guest choreographers lillian stillwell, pablo sansalvador, sandra kramerová and the dance collective bufo makmal. 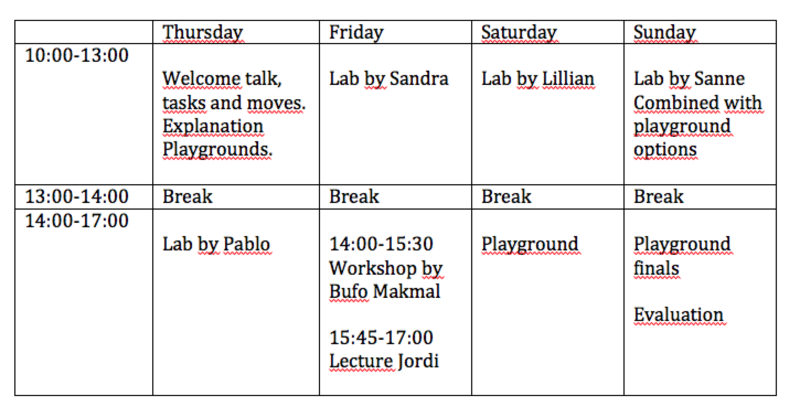 the artistic team of choreolab europe (sanne clifford, anja gallagher and jordi ribot thunnissen) will be part of the labs, playgrounds and lectures as well. this team of choreographers & collaborators will share insights and their artistic research approaches on their selected topics. explorations on how dance and music can be integrated to communicate content with a multi-disciplinary approach. the music of mozart will be the basis for the movement material, which will then be exploited for its story-telling potential. together with invited guest collaborators tom ryser (director) and martin o. (singer). on how specific human qualities of the seven virtues and deadly sins can be represented through movement and detailed body language. "we will create a melting pot that uses choreographic and design thinking techniques and methodologies to initiate the creative process"
her research includes exploration of athletics, resistance-based movement quality and stamina-driven action. a dance language influenced by sports imagery will shape itself into choreographic scores according to the participants´creative visions and artistic perspectives. held by rosie terry toogood and margarita kennedy. "we will welcome the participants to allow there own way of movement to flow. we will share possibilities how to access this, to enhance it and to feel more self power in the own physicality." read this blog by Ruby to get a vast experience overview of the fall lab in basel 2017.